PostEurop, the association representing national postal operators was pleased to receive second place, silver award for the category "Best Membership Initiative by an Association" at the European Associations Awards 2018 last Friday. The European Association Awards ceremony brought together more than 250 senior professionals from associations across Europe. The programme recognises individuals, teams and initiatives, and highlighted excellence in how associations operate and serve their members. PostEurop's entry was non-other than the "Membership Survival Kit – All you need to know to run a committee or working group", aimed at further driving efficiency, increasing member engagement and promote transparency. PostEurop's creative Survival Kit which brought together relevant information for what was essentially a binder containing questions and answers, guidelines and official documents to help Chairs and Vice-Chairs of a Committee or working group to understand the functioning of the Association. The responsibility of leading a working group is a serious matter but it can also be fun for Members. A series of training sessions were organised to allow members to learn more and provide feedback. The manual is easy to use, relevant and regularly updated. "An interesting way to improving the management of the association." "Practical, useful, innovative. Something all associations should do." “This is the first time, we were asked to submit an entry. We are absolutely delighted to have received this recognition for our work and be placed among the other brilliant entries. 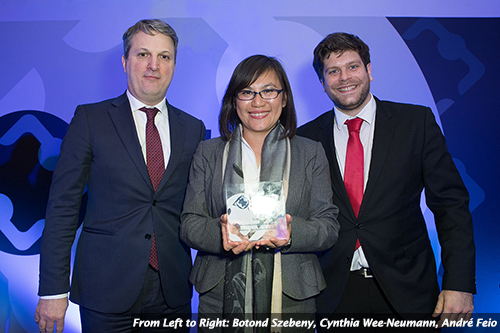 We dedicate this award to the rest of the team and our Members” said Cynthia Wee-Neumann, Communications Manager at PostEurop.